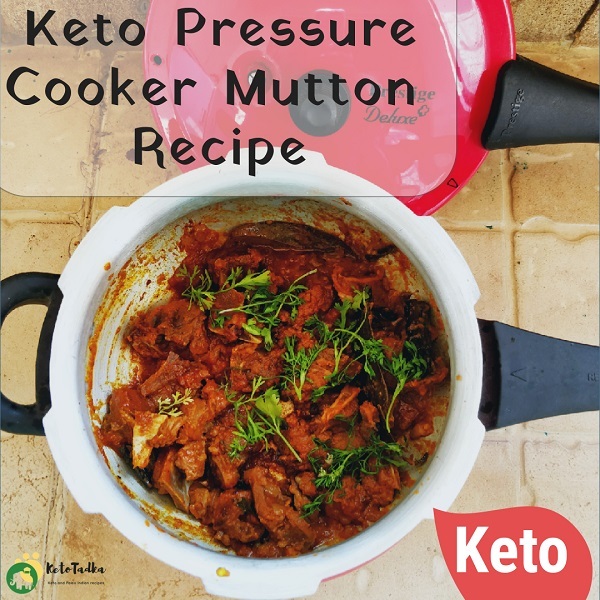 Keto Mutton Recipe is what you guys asked for. 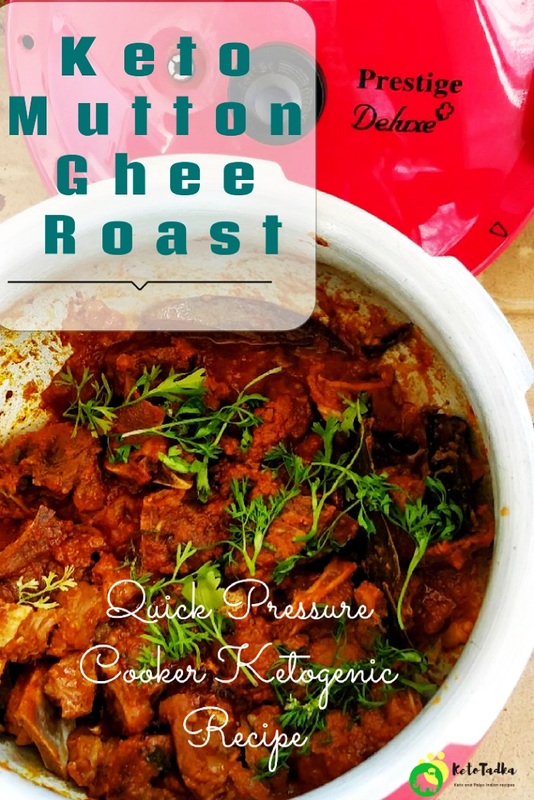 This one is Keto Mutton Ghee roast made in pressure cooker which is ready in less than 30 minutes. 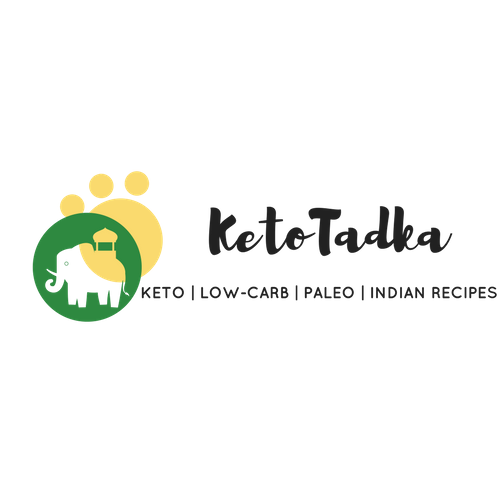 The ease of cooking it in the cooker makes the recipe very much interesting and you can definitely make your ketogenic way of eating easier. What will you need ? 6] Tomato pulp of two small tomatoes. The texture is not watery like a curry but is more like a dry indian curry. The pieces are properly coated with the gheelicious curry base and the meat is cooker near to fork-tender in the pressure cooker in less than 30 minutes. Do you guys have a pressure cooker small as for making meats or biryanis ? I have the Handi pressure cooker and it is so good because of the compact size and is easy to clean later. Please note that I am not a medical or nutritional professional. I am simply recounting and sharing my own experiences on this blog. Nothing I express here should be taken as medical advice and you should consult with your doctor before starting any diet or exercise program. I provide nutritional information for my recipes simply as a courtesy to my readers. It is calculated using Myfitnesspal app and I remove sugar alcohols (erythritol and xylitol) from the final carb count and net carb count, as it does not affect my own blood glucose levels. I do my best to be as accurate as possible but you should independently calculate nutritional information on your own before relying on them. I expressly disclaim any and all liability of any kind with respect to any act or omission wholly or in part in reliance on anything contained in this website. © Ketotadka.com 2018. Unauthorized use and/or duplication of this material without express and written permission from this site’s author and/or owner is strictly prohibited. Excerpts and links may be used, provided that full and clear credit is given to Ketotadka.com with appropriate and specific direction to the original content. Marinade the mutton with everything and keep it aside for 2 hours. You can keep it in the fridge for the marination time. In the cooker on low flame, melt the ghee. Add the whole spices until they leave aroma. Add the garam masala, cumin and coriander powder. Mix and cook for 5 minutes. Add the tomato pulp ( I just cut 2 small tomatoes in the grinder and made pulp) and mix well. Cook for 5 minutes. Keep turning. Add water and stir well. Close the lid of the cooker and give 6-7 whistles. Switch off the flame. Rest it as it is for 10 minutes. Let all the steam escape , lift the whistle up to do that. Garnish with Coriander. You can serve it with Keto Naan or have as it is. Make sure you squeeze some lemon before having it, adds to the taste more.